Book Summary: “Deadly Sin” part two! How can Harley protect somebody who’s vanished into witness protection? Unfortunately, Harley Sinn has a lead that she doesn’t! 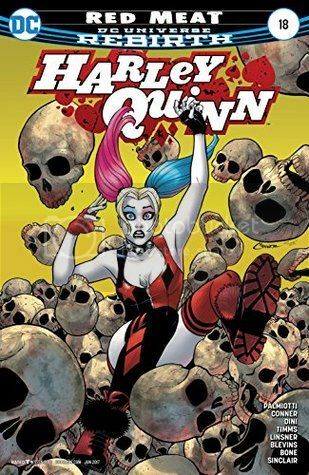 And in “Harley Loves Joker” part two, Harley tries to make it up to her puddin’ after her colossal blunder—but The Joker’s wrath is not easily soothed! This issue picks up where the last one has left off. Harley has been kidnapped! Red Tool chases after the car that has Harley in it but he is foiled when the police set their sights on him, forcing him to take refuge behind a statute. He calls in to Eggy, who tells him that he does not have to go rescue Harley alone...that he can round up the gang to help. Of course, Red Tool has no patience to wait and heads off to rescue Harley on his own. Mix in a Batgirl from the future (a storyline looking to appear soon?) and the Mayor trying to rid the city of the homeless via cannibals! There seemed to be no action whatsoever in it. It felt a bit stalled. Yeah, we know we need to set up the climatic scenes that will lead to the end of this storyline since we have another part of a storyline set up! I should be used to such tactics but this comic book did nothing for me. It was boring and I nearly put it down to get ready for work but I needed to see if there was just something that would give hint as to why there was an interest in Harley's kidnapping. Yeah, I know it is because she was investigating and the mayor wanted her out of the way but who is the one really behind all of this. There is always the main boss. I am hoping the series picks up again with the next issue and that there will be more than just a filler.